Spotify yesterday announced the launch of Artist apps for four artists, namely Quincy Jones, Tiësto, Rancid and Disturbed. This is another important step in Spotify’s music strategy, and one that is more important than may first appear. Spotify’s App and API strategy (of which I have gone on record as being something of a fan of) may not have had anywhere near as much momentum as hoped, but it is making solid progress and the artist apps will give it a much needed boost. The artist apps though are part of a bigger bid for relevance and mass market appeal. One major problem with streaming music services lies in the fact they provide unlimited access to all the music in the world: there is so much choice that there is no choice at all. Though Spotify has started work on improving its discovery story – much of it through 3rd party apps – discovery remains problematic. Another problem in streaming services the artist’s brand is inherently subjugated to the service’s brand: consumers pay for access to all the music, not for an artist or two. In the analogue era the artist brand dominated with singles and artist albums. In the age of the playlist, a la carte cherry picking and unlimited on-demand access, the artist brand often struggles for voice in a sea of discovery noise and clutter. Artist apps though kill the two proverbial birds with the same stone: simultaneously enhancing the artist brand and music discovery. 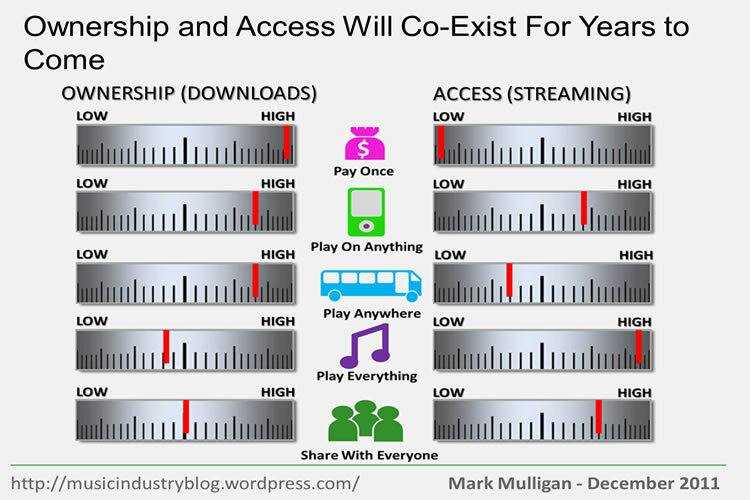 A key dynamic of the ownership-to-access transition has been the difficulty of communicating a sense of permanence and tangibility in music service experiences. Playlists may be one of the early defining characteristics of the consumption-era and may deliver great user benefits, but the very fact that they are so easy to create and to delete contributes both to a sense of transience and of having little monetary value. Thus playlists do not effectively communicate enough tangible value over the CD, which is an illustration of why the majority of digital consumers still buy CDs. For streaming services – and indeed digital as a whole – to come of age and to appeal to the mass market, they need to develop features that go beyond the excel spreadsheet-music-service approach. This doesn’t mean a need to deliver ownership but instead to meet some of the fundamental consumer needs and tangibility that physical music experiences deliver. Spotify artist apps are a step in this direction, delivering an audio visual and curated artist experience. It is fair to say that the current iteration of artist apps are far from the finished article, the first step on the journey, but at least that journey has been started. The digital music marketplace more broadly needs to rise to the challenge of ensuring that artist specific experiences like these become a standard feature of digital music experiences. 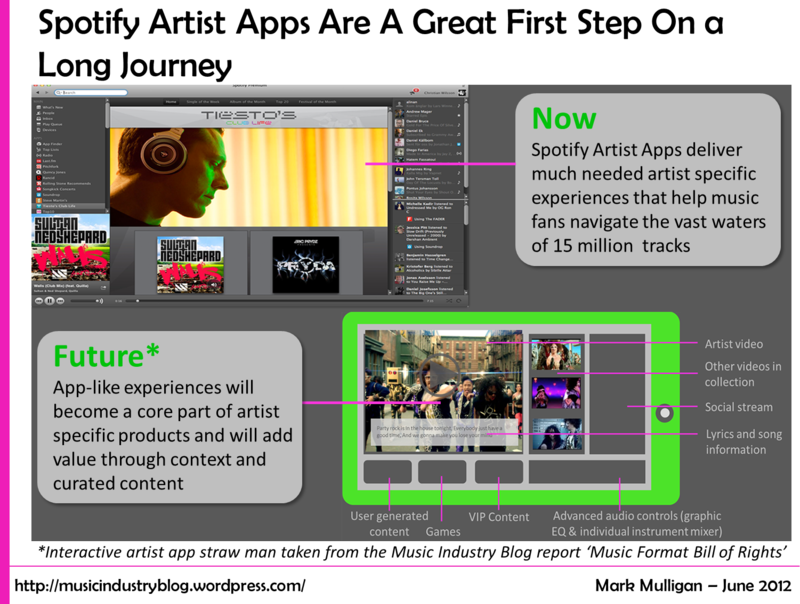 Spotify artist apps , when set alongside the theoretical music product prototype I sketched out in my ‘Music Format Bill of Rights’ report (see figure) and viewed in the context of the longer term music product and format evolution, are a glimpse into the future. Spotify needs to kick on from here with full integration of multimedia assets such as video and games, and of course it needs many many more artists, long before which it will also need to have hit upon an elegant means of filing and navigating the apps. But for now, Spotify artist apps are welcome early step on the road to mass market relevance and digital music product tangibility.